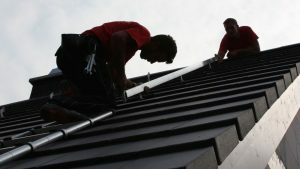 Installing PV arrays on to an already existing roof structure has become standard these days. A wide variety of mounting systems allow a fast and safe installation of the solar panels – even at high loads from wind or snow – which makes it quite inexpensive to put up such solar generators. They are designed to meet the structural requirements of the of the existing roof construction. health and safety during on-roof assembly. For aesthetic reasons or in the case of inclined roofs of listed buildings, it can be sensible to replace the entire roof cover with solar panels. These are then integrated into the water-draining layer. It goes without saying, that such in-roof systems need to be extremely waterproof. One issue can be sufficient ventilation of the undersides of the panels to avoid overheating during the summer. The aesthetic possibilities range from standard panels via coloured non-reflective panels to solar panels in the shape of roofing tiles. Such solutions are suitable for inclined roofs that need to meet the highest standards of building owners and architects. These products are also useful in the renovation of historic buildings. It is even possible to equip barrel roofs with spherical solar panels. In fact, the solar technology becomes an integral part of the roof design – creating a very special light ambience in the building. The façade of a building is usually the most visible part of a building as well as an important architectural element. That is why demands in terms of aesthetics are so high when it comes to façade-mounted systems. This industry can offer architects an almost limitless variety of options. health and safety during façade mounting. 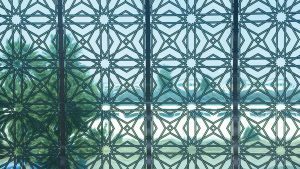 It is easiest to use regular panels which, however, need to be certified for façade-based applications. The requirements may vary considerably between countries. Otherwise, an extensive certification for each individual case is necessary. On the other hand, panels built according to an architect’s specifications are even more expensive. But they allow the architect the same freedom in terms of design as conventional laminated glass. The available products range from semi-transparent panels in various colours to coloured panels that can render the solar technology fully invisible. Even solar panels that can be printed on are available. Solar-thermal and solar air collectors do not allow that kind of variety of uses. Especially when it comes to the integration of photovoltaics into the building envelope, thin-film PV can play to its own strengths. As opposed to crystalline panels, thin film panels are not sub-divided into wafer cells made of silicon. Instead, the photoactive semiconductors are applied to the entire glass pane, and only subsequently separated into cells – using lasers or extremely thin needles. That is why their appearance resembles normal laminated glass panes. The variety of available colours, shapes and sizes is almost endless. 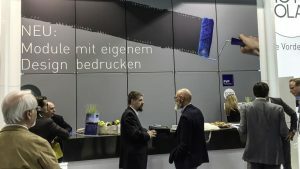 Thin film panels are generally manufactured without a frame which has two advantages: On the one hand, they have a very homogenous surface structure, and they are lighter and more easy to mount. As is the case for all panel types, thin film panels also have to be certified for installation as part of a façade or a roof. 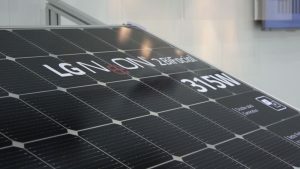 Because they work better under low or scattered light conditions, thin film panels are ideal for solar arrays that are not perfectly oriented towards the sun – e.g. façades. Photovoltaics using crystalline technology is the most prevalent. A wide range of crystalline façade installations have already been realised. Silicon-based crystalline panels allow architects the greatest degree of creative freedom. A prerequisite for integrating solar panels into the building envelope is that they meet the building codes and are certified for façade- or roof-mounting. For that reason, glass-glass panels are very popular for building integration. Organic photovoltaics (OPV) probably allows the greatest degree of design freedom. The panels are made from multiple layers of organic monomers and polymers that are applied to a substrate – commonly a flexible membrane. The prefabricated semiconductor blanks are cut and contacted according to the customer’s requirements. This has no limitations whatsoever, and even includes fully transparent contacts. Organic solar panels are manufactured in any colour imaginable. Semi-transparency is also possible. The suppliers range from glass manufacturers via producers of membranes for complex roof constructions to suppliers of structural elements in either concrete, fibre cement, steel or aluminium. That allows the architect to plan the design using the familiar structural elements which already meet the common building standards and regulations. Of course, the wiring of the solar elements will have to be taken into account. Organic solar membranes work better under low-light conditions than crystalline panels. Even under a cloudy sky or indirect sunlight do they still produce enough electricity. Furthermore, their output does not diminish with rising temperatures. 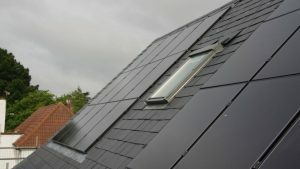 Solar roof tiles are a special case of integrating a photovoltaics array into the roof of a building (in-roof systems). They are manufactured by integrating a small solar panel into a conventional roof tile made from clay, concrete or synthetic materials. Often, this solar element can even be coloured to make it blend with the actual tile. This makes this technology invisible. The architect can combine the conventional look of a roof with the integration of a solar array, thus making such roof tiles most suitable for restoring historic and listed buildings. health and safety during on-roof mounting. 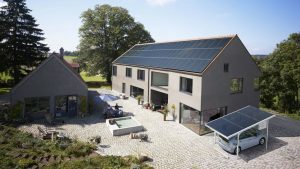 An important point when it comes to solar roof tiles: The roof has to be well-accessible from the rear, since many cables and the power electronics needs a certain amount of room. That is also the case to ensure later inspections and maintenance. Furthermore, the waste heat of the small tile panels needs to be able to dissipate. A major advantage is the ease of repairs: Like conventional ones, solar roof tiles can be replaced individually. Solar panels or solar roof tiles both generate DC electricity which needs to be gathered together with cables and then transported off the roof or from behind the façade. This DC current is then converted in an inverter to either be consumed in the building or fed into the power grid. Depending on the application, there are a myriad of products for wiring (DC or AC), power electronics (inverters) as well as fuses and circuit breakers. notes on inspections and maintenance. Photovoltaic solar panels generate electricity which has to be stored in or near the building in order to balance out generation and consumption as much as possible. Electricity from solar panels can easily be combined with power from cogeneration units, fuel cells or the power grid (wind power). Solar heat generated by solar-thermal collectors is there for heating the drinking water in the summer or to raise the temperature of the heat buffer storage tank, which the natural gas- or wood pellet-fired boiler is needed less. The advantage of solar electricity generation: The generated electricity can also be used to heat water or charge an electric vehicle. 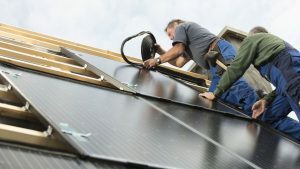 This generally makes solar electricity more valuable than solar-thermal heat – with the exception of some commercial applications requiring large amounts of hot water during the summer (e.g. the hotel industry, agriculture, industrial process heat). self-sufficient power supply using self-generated electricity. 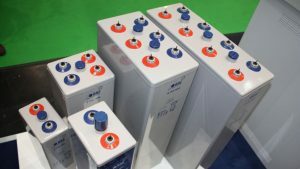 Regardless of what form of energy storage is to be used: The building has to include the space and facilities to house either the storage tank, pipes and gauges or the batteries, wiring and ventilation (in the case of lead batteries). Electric mobility is gaining ground globally: An increasing number of carmakers are bringing out EVs. The question remains: Where can owners of EVs charge them up? This tends not to be a problem for homeowners. Their garage or the carport can be equipped with a high-power socket, a wall box or a charge point. This transforms the house into a filling station. That significantly increases the gains from self-consuming the self-generated electricity from solar or other generators. 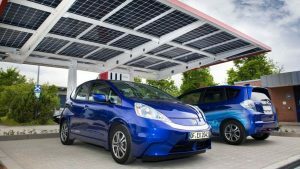 charging EVs from stationary fuel cells and cogeneration units. By now, most newly constructed buildings are built to very strict thermal insulation standards. 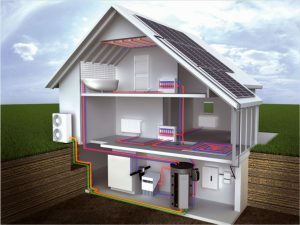 As a modern method of heating, heat pumps work very well in combination with solar PV off the roof or the façade. 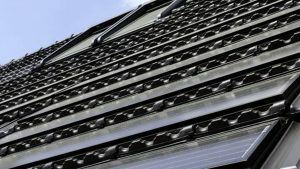 Solar-thermal collectors can also serve to pre-heat the inflow of a heat pump and thus increase their efficiency. heat pumps for generating hot drinking water. When planning to include a heat pump for the building heat supply, it is crucial to take it into account already at the planning stage and to lay the ground work for its installation and efficient operation. Heat pumps are often very suitable for upgrading an existing building’s heating system, particularly in rural areas. 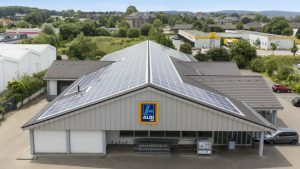 When planning to use solar energy, it is important to take a few things into consideration before erecting the building: orientation of the structure, position and inclination of the rooftop, additional roof space (conservatory, roof elements overhanging a veranda, carports), suitable façades as well as shading: If the building is optimally designed, the solar energy can be used most efficiently. And that considerable lowers its operating costs. cooperation among architects, building planners and solar planners. Solar technologies allow the ventilation and cooling down of overheated rooms in summer as well as specialised process cooling applications. In general, solar-thermal systems require extensive hydraulics. Where large-scale cooling is required, very large solar-thermal collectors might be needed, as well as sufficiently dimensioned heat exchangers. As the pumps, fans and power units of the solar-thermal system run on electricity anyway, it is often much simpler to take care of the climate control and refrigeration with electrically operated systems. The solar electricity that is most available during the hottest part of the day can be fed directly into the refrigeration units or other cooling technologies. By working with electric compressors, you get valuable cooling from cheap solar power. electrical refrigeration technologies and solar power.